For as far back as I can remember, I have been caught up in a never ending cycle of events. The roller-coaster, loop de loop of working and semi maintaining, using, jail or some other institution, come home and start all over again. The up and down, the building of then tearing down only to have to rebuild again. The cycle was always the same. Although the pain, misery and suffering were at different degrees in different cycles. The end results were inevitable, unmistakable and undeniably the same. With very little variation from this routine I began to believe that this was how my life was meant to be. So without the information that was so readily available. I continued to play my part in my self destruction. Like an actor I memorized all my lines. I have been feeling out of place lately. Not because I am living in a new state but because of being disconnected from the one thing that has saved my life. I have been allowing my disease to manipulate my mood and dictate my actions all the while justifying my actions and behaviors as dislike for the fellowship and the people in it. Using the fact that people will disappoint you, and people don’t treat you like you treat them as a reason to fall back and isolate. Isolation is part of the beginning stages of the cycle that I mentioned earlier. I have already started the cycle by allowing my diseased thinking to take the wheel and separate me from the rest of the herd. (Metaphorically speaking). Allowing that crazy to drive can and will only lead to poor decision making, chaos, mayhem and ultimately disasters. I am grateful for the power given to me today by my Higher Power. The ability to stop, think and make a choice. The ability to see yourself coming is a gift, but it’s only valuable if I use that knowledge and change the direction. Today I am making the choice to change my direction. 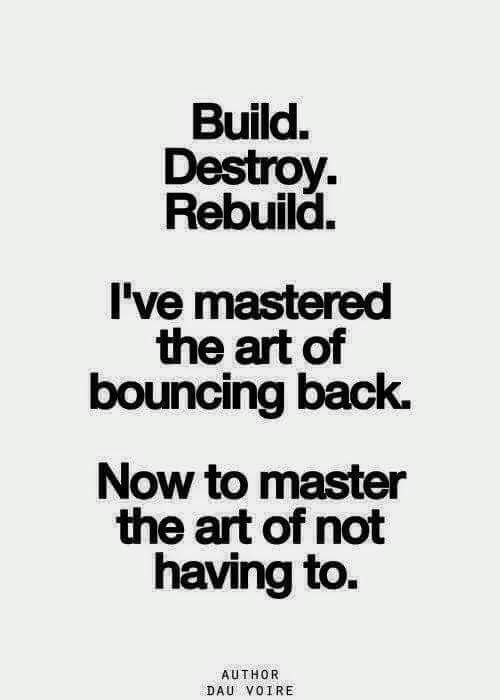 I will not Build, Destroy only to rebuild again.